I always tell people I grew up in a small town in Nebraska. The truth is (and I actually checked the figures on the internet, so you know it’s right) that when I was born in 1953, there were probably close to 10,000 people living in the Midwestern town of Columbus. When I left for college in 1972, there were over 15,000 happy Columbus residents. Well, I don’t know if all 15,000 were happy. I’m overthinking…. Size is relative, my friends. I continue to maintain I lived in a small town. Still, that town had a J.C. Penney store, a Montgomery Wards, a couple of dime stores, a great drug store, and, of course, a fabulous bakery. My point is that if I needed to buy underwear, I knew exactly where to go. Last weekend, I spent a few days in Estes Park, Colorado, with my two sisters. Estes Park, for those who might not know, is a small resort town of just over 6,000 located near Rocky Mountain National Park. There are lots of restaurants, two – count ‘em – two taffy stores, and shops selling all manner of chatzkies. We have wonderful memories of Estes, and its proximity to the beautiful national park makes it one of our favorite places to visit. Bec arrived first, driving in from Fort Collins, and I met her there. I had packed my bag quite hastily, and had included a picnic bag full of items for a cook-out that evening. At some point later in the afternoon, it occurred to me that, while I had remembered the steaks, I had forgotten to pack pajamas. No worries, Bec said. I have a spare pair. Bec and I put our heads together to try to come up with a place that sold underwear. 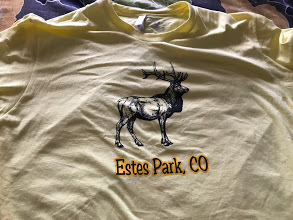 Had I been looking for a t-shirt that said My Mom and Dad Went to Estes Park and All I Got Was This Stupid T-Shirt, or a coffee cup with a cross-eyed bear saying I Can BEARly Think Before Coffee or a lifetime supply of petrified wood, I would have been set. But we simply couldn’t imagine where one would find ladies’ underwear in this tourist spot. No Walmart. No Target. Amazon can’t make one-hour deliveries. So I set off to the motel office, hoping against hope that the proprietor – Fred – wouldn’t be attending the desk, and that instead a woman would be sitting there. No such luck. There was Fred, looking cheerful. Can I help you? he asked happily. In a voice that was truly sotto voce, I said Hello Fred. This is really embarrassing, but can you tell me where I can buy women’s underwear in this town? Fred gives it a moment’s thought, turns towards the back room, and hollars – HOLLARS – Hey Joe! Where can this lady buy women’s underwear? Joe comes out, and you can see he’s giving it a lot of thought. After a moment or two, Joe says, Try True Value Hardware. It’s in the Safeway Shopping Center. True Value Hardware. Men are from Mars. If only I had three pairs of underwear and no corkscrews. But I knew that there was a pharmacy in that same shopping center, and I had high hopes that perhaps they sold women’s underwear. I walk into the pharmacy, and there is, of course, only a man working there. I take a deep breath and ask him if they by any chance sell ladies’ underwear. No Ma’am, we sure don’t, he said. Try True Value. It’s just across the parking lot. Again with the hardware store. I was successful, however, at finding a toothbrush at the pharmacy. As I left the store, I saw the True Value Hardware Store. What do I have to lose, I thought. I walk into the hardware store, and there is, of course, a man at the front counter. Big man. Three-day growth of beard. Chewing on a toothpick. Do you by any chance sell women’s underwear? I ask him. You’ve probably guessed his answer by now. Yes, Ma’am. They’re on Aisle 16, just across from the ammo. Well, I made up the part about the ammo, but I’m not making up the part about True Value Hardware selling ladies’ underwear. I also found a Size 2XL t-shirt that with a picture of an elk and ESTES PARK, COLORADO in big letters. AKA, a nightgown…. Ace might be the place with the helpful hardware man, but True Value has the best selection of women’s cotton briefs in Estes Park. Well, the only selection, it seems. I have pondered and reached no conclusion. Please start your list today of items to pack for Thursday night! At least FC has stores that sell underwear and not ammo. Moral to the story: remember your essentials when visiting Estes Park.